Surfing is necessarily based on a good knowledge of the marine environment but also on compliance priorities and rules of surfer . Our coastline is one of the places in Europe most famous for surfing. Low pressure on the seas of Ireland and England, directly send beautiful waves all year on our shores. 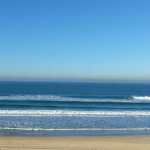 The particularity of the Landes waves is that they break on sandy bottoms , this is called beach break The shape and quality of the waves depends on the sandbar in place and direction of the swell. The action of the tide and the waves on the sand generates phenomena of currents that can be violent and form what are called baïnes. On low tide, the baïne is empty, it is more safe.On high tide, its functioning, and it could be dangerous if you are at the wrong place. If you find yourself trained in a Baïne the best action to do (until the lifeguard are with you) is especially not fight against this current that takes you off .Keep calm and let you drift , try to swim parallel to the beach and exit from the baïne . FOLLOW THE RULES AND USE OF PRIORITY TO AVOID COLLISION. GIVING ASSISTANCE TO PEOPLE IN DISTRESS. In Hawaiian , surfing says he’e Nalu , he’e to flow like a liquid and Nalu which indicates both the emergence of a wave and amniotic fluid coating the newborn. Much more than a physical discipline rather a disciplined life, as demanding qu’exaltante. Surfing is first and foremost accept rowing is a school of humility, fun drag is inseparable from the effort that has provided for doing so. In life, as on the waves, the great art is to support the movement , be one with the elements, always stronger than itself. Water as in life , everything can change from one moment to another, wind, tide, swell , we must learn to enjoy the moment. Surfing is infinite , boundless , surfer opens to the world. Search new waves is also discovering other cultures, it’s open our eyes to our planet. Surfing is also a commitment to the environment so thE future generations could enjoy the ocean for long times.